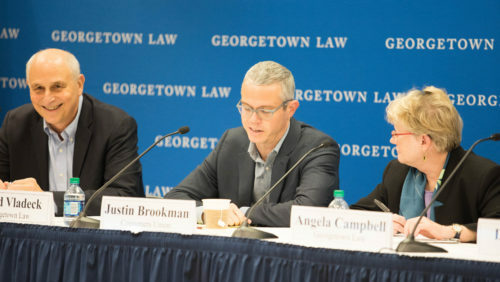 Professor David Vladeck, Justin Brookman of Consumers Union and Professor Angela Campbell at "COPPA at 20: Protecting Children's Privacy in the New Digital Era" at Georgetown Law October 24. At 20 years old, a landmark child online privacy law is well past the age of the kids it was designed to protect. 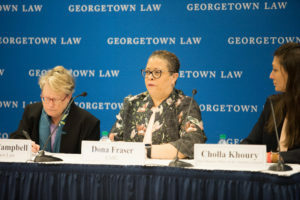 Georgetown Law’s Institute for Technology Law & Policy gathered distinguished experts from government, the tech industry, and advocacy groups October 24 to examine how a law enacted in the age of dial-up is faring today. The Children’s Online Privacy Protection Act (COPPA), enacted in 1998, requires websites and online services aimed at children to provide notice to parents and get their permission before collecting or using personal information from children under 13. They also must post privacy policies and provide parents access to children’s data they’ve collected. The Federal Trade Commission regulates and enforces the law. Professor Angela Campbell, Dona Fraser of CARU and Cholla Khoury of the New Mexico Office of the Attorney General. FTC Commissioner Rebecca Slaughter provided the keynote speech at the event, “COPPA at 20: Protecting Children’s Privacy in the New Digital Era,” held in the Gewirz Student Center. Slaughter said the Commission has worked to keep up with technological changes since the law went into effect, addressing smartphones, social networking, online photos, video, and audio and Internet-connected toys. “The FTC will continue to do everything in its power to respond to developments in technology and ensure that the protections afforded by COPPA are as effective as possible,” Slaughter said. The event featured panel discussions on COPPA’s effectiveness in light of changes in how children interact with the Internet and the potential for technology addiction; how key provisions of the law have been interpreted, including how to assign liability with third parties involved in tracking users’ data; and COPPA enforcement, specifically the “safe harbor” program that lets industry self-regulate compliance with the law. Professor David Vladeck, who previously served as director of the FTC’s Bureau of Consumer Protection, which is responsible for enforcing COPPA, reiterated that the law needs to adapt. “We have this regulatory regime that was crafted before anyone could think about these things,” Vladeck said, holding up his smartphone. The law also needs a higher profile, said Vladeck, who oversaw a 2012 revision of the FTC’s COPPA rules while he was there. Professor Laura Moy, executive director of the Georgetown Center on Privacy & Technology; Professor Angela Campbell, who leads the Communications & Technology Clinic within Georgetown Law’s Institute for Public Representation; and Associate Dean Paul Ohm also participated. Campbell was involved in efforts that led to COPPA’s passage, and Ohm worked on the 2012 COPPA regulations while serving as a senior policy advisor to the FTC. Campbell, who as part of her work with the clinic has filed numerous FTC complaints over COPPA violations, concluded that COPPA’s safe harbor system allowing industry to self-regulate compliance with the law was “flawed.” Companies that qualify for one of the several FTC-approved safe harbor programs get a seal of approval that may mislead parents, she argued. Ohm, who moderated the discussion on technological changes since COPPA’s passage, noted that the main concerns back then, such as children’s advertising, differ from those of today, such as cyberstalking. There’s an “inherent tension” in the law, he said — whether it’s about advertising targeted at children, children’s privacy or both. Other panelists represented a range of organizations, including the Center for Digital Democracy, The Electronic Privacy Information Center, the Software & Information Industry Association, and the New America Foundation. The Future of Privacy Forum, CommonSense Media, Center for Democracy & Technology, and Consumers Union co-sponsored the event.